You have a pretty comprehensive website and some amazing archive of vintage recordings. I was wondering if you had more info on the Sarangiya (Hamid Hussain for example) himself other than just a picture. I would be interested in knowing more about him. Hi .. Well, they have more than just the pic 🙂 The songs can be downloaded if you are using Internet Explorer .. The pages do not open in Mozilla . I just clicked on the raag link and the download automatically started thru my Bitcomet . Happy listening ! “Ustad Hamid Husain belonged to the illustrious Muradabad Gharana of sarangi players. He was born in Rampur in 1923. Soon after his birth, his grandfather Haider Husain Khan along with father Abid Husain joined the court of Rampur. The young Hamid received his initial training in sarangi from his father and grandfather. He also got training in sarangi from his maternal unclce Ustad Ali Jan of Rampur. Hamid Husain joined the All India Radio, Delhi when he was only 15 years old. After the death of his grandfather, he shifted to Bombay in 1939. It was during his tenure there that Noor Jehan as a teenager was auditioned and sang for the first time on Radio accompanied by Hamid Husain. In 1943 he went on an extensive tour of Europe where he gave solo sarangi performances. 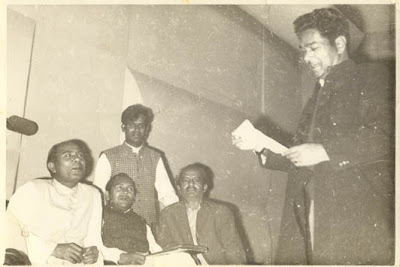 Ustad Hamid Husain accompanied most of the senior vocalists of his time including Ustad Fayyaz Khan, Ustad Amir Khan, Begum Akhtar (Akhtar Bai Faizabadi), Roshan Ara Begum, Ustad Nazakat Ali-Ustad Salamat Ali Khan and Ustad Amanat Ali-Ustad Fateh Ali Khan. He had enjoyed a lengthy association with Ustad Bade Ghulam Ali Khan. After independence in 1947, he joined Radio Pakistan, Dacca and was later transferred to Karachi where he served until his death. In addition to the knowledge he gained from his own gharana, the experience of accompanying various vocalists of different gharanas enhanced his scope and from a young age, Hamid Husain became a storehouse of traditional compositions (bandishein). Apart from his artistic excellence, Ustad Hamid Husain was one of the few musicians who were foremost in promoting classical music by generously transferring the art to non-professional learners. He never kept anything away from his disciples. The long list of his professional and amateur students includes Dinaz Minwala, M. Iqbal, Dr Regular Burckhardt Qureshi, flautist Ustad Salamat Husain and Habib Wali Mohammad. He is among the best jewels. My late father, James A (Jim) Lee, worked for USAID in Karachi from 1961 to 1963. He was also a jazz pianist, and became interested in the classical music of Pakistan, and with the idea of a fusion of this music with western Jazz. He and Usted Hamid Hussein formed a quintet during this time which played a number of concerts, sponsored I believe by the American Embassy, showcasing this music. The other members of the quintet were Elias Bokhari, who was a Western jazz drummer; tabla player Anwar Hussein, and a Phillipino three-string bassist named Lito (Joselito) – I don’t know his other name. During this time my dad composed a number of “jazz ragas” which he later recorded. Somewhere we have reel-to-reel recordings of some of the band’s performances, which I’d love to digitize and make available. apologies, you posted the radio pakistan signature tune when you turned 2 years old..
here is a link to its AIR counterpart. composed by walter kaufmann in 1936 and conducted and recorded ( and not composed, as i had thought) by mehli mehta, zubin’s father. thank you barni saheb for that bio. i guess its too much to ask if the CD and publication are still available. and thats a fantastic story hilarie…yes we would love to hear that quintet! I studied under him for about 2 years ……he was a great gentleman Musician and he left us all too soon.